Google on Monday announced the acquisition of Picnik, a photo-editing Website. The move is not surprising, considering Google's focus on promoting Web apps and the company's upcoming Google Chrome OS. Picnik will also be a great complement to Picasa, Google's photo storage and sharing site. In some ways, Picnik already integrates with Picasa along with Flickr, Facebook, and anywhere else you can find an image online. 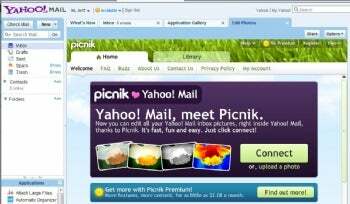 What is surprising is that Yahoo didn't grab the service first, especially when you consider that you can use Picnik's photo editing tools right inside Yahoo Mail -- a feature not currently a part of Gmail. Picasa isn't just a photo storage and sharing site; Google also provides a free desktop application for basic photo editing. It offers some features that are very similar to what Picnik offers, such as cropping, red eye correction, photo coloring effects, and retouching photos. But you can also use Picasa desktop to print and e-mail photos; buy personalized photo cards, books, and prints from providers like Kodak, Snapfish, and Walgreens; send photos to Blogger; upload photos from your hard drive; and create slideshow movies with a soundtrack. So what will happen now? Will Picnik be rebranded as Picasa and still include the free desktop application? Will Picasa desktop features be integrated into the Picnik Web app or vice versa? It's all unclear at the moment, but hopefully we'll find out soon. What will happen to Picnik's premium features? Almost everywhere you look on Picnik's site are ads encouraging you to upgrade to the site's premium features for as little as $2.08 a month. These features include more image effects, layering, advanced editing tools, and the ability to connect to more than one photo sharing service--Flickr, Facebook, Picasa, etc.--at a time. With Google's emphasis on providing free tools to empower the masses, will the company drop the paywall and open up Picnik's premium services to everyone for free? Will you have to sign up? Although you can create a Picnik account, the site does not require you to sign up to use its non-premium features. Will Google keep that the same or will you have to use your Google account or existing Picnik account to use the service? What new features and integration are coming? Google said in a blog post that it "would like to" continue supporting Picnik integration with non-Google services like Flickr, Facebook, and Yahoo Mail. But Google also said the company would be working hard on integration and new features. So what does this mean? Will it turn out that Google won't be able to support other services after all (even if they "would like to")? It will also be interesting to see what kind of new features Google adds to Picnik. YouTube video editing perhaps? There are already photo editing applications for Android, such as PicSay and PhotoShop.com Mobile, so why not add Picnik to the mix? If a Picnik app had deep integration with photo services like Flickr, Picasa, and Facebook, something that PicSay and PhotoShop.com lack, Picnik mobile would have an advantage. If a Picnik mobile app is in the works, will it also come to competing mobile platforms like the iPhone, Blackberry, and Windows Phone 7 Series or would Picnik mobile remain exclusively on the Android platform? Will Picnik's Premium Pop-Ups influence Google? Google offers a premium storage service is shared among your Gmail, Google Docs, and Picasa accounts. You already get a substantial amount of free storage space in each service, but you can add as little as an extra 20GB for $5 a year or up to 16TB of storage for almost $4100 a year. Right now, these offers are fairly invisible and stay out of your way, but will Google adopt Picnik's method of having a storage pop-up appear every time you open a new window, Gmail message, or document? It sounds unlikely, but hey, if it worked for Picnik maybe Google would be tempted to adopt this strategy.